In a bid to increase coconut cultivation, the Plantations Industries Ministry has undertaken a mammoth project to grow 80,000 acres of coconut only in the North East. 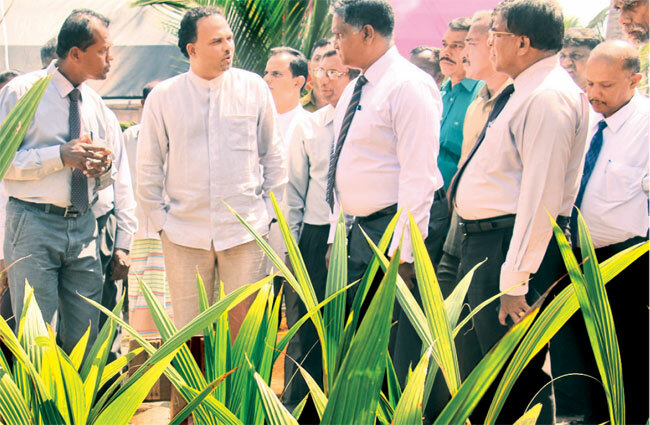 Plantation Industries Minister Navin Dissanayake said the total coconut production for 2015 was 3,056 million nuts. However the demand was much more and there is an urgent need for more coconuts. This demand is also from the industrial sector and also from companies engaged in the export business of coconut by products.In addtion diseases to coconut platations in the South and felling of coconut trees for housing too have resulted in the decline of the supply. The Minister said that they have identified this grey area and have now set a target to produce 3,600 million nuts for 2016. “Tea and Coconut” is another ongoing program from March 2016. “Under this we hope to grow coconut in low county tea estates as a second crop.This would be except few areas in Nuwara eliya and Badulla that don’t have soil and weather conditions for coconut. Currently the Sri Lanka Coconut Cultivation is more than eleven hundred thousands acres.